PC Mark 8 is a synthetic benchmark that puts the machines through normal usage scenarios such as web browsing, document writing, video encoding, photo editing and casual gaming. A good gauge of overall performance is the Home benchmark, which combines all of the above mentioned tasks. All of our notebooks have similar components, with an Intel Core i7 processor, integrated graphics and a fast SSD. The only differences are Sony's Vaio Pro 13, which has just 4GB RAM, and ASUS Zenbook UX301, which has a more powerful 2.8 GHz processor and Intel Iris 5100 graphics. For the Home benchmark, the Acer Aspire S7 managed to stay ahead of the ASUS Zenbook UX301, despite the latter having a more powerful CPU and GPU. This result indicates that the UX301's superior chip doesn't give it much of an advantage if you're using it as a general purpose machine. In the Creative Benchmark, which tests the machines' abilities to encode and edit multimedia, as well as gaming, the Zenbook UX301 CPU starts to perform as expected. 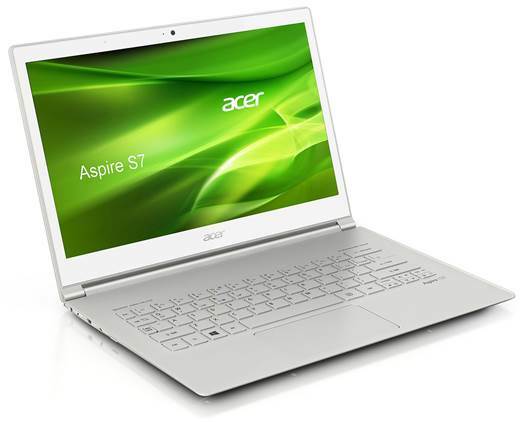 It scored 23% better than the Acer Aspire S7, mostly thanks to its more powerful onboard Intel Iris graphics 5100, which is responsible for rendering and encoding multimedia. And as for the Work benchmark, it's the enterprise-friendly Toshiba Portege Z30 that leads the Ultrabooks. Its no-frills design allows it to perform best on what's most important for its target audience (browsing and document editing) while preserving battery life. The Zenbook UX301's Intel Iris graphics 5100 led the way here, performing 18% better in 3DMark (2013) than the Acer Aspire S7, which had the best gaming results among our Intel HD 4400 machines. The notebook lagging behind the rest was again the Sony Vaio Pro 13, which is again handicapped by its lack of RAM. The Zenbook UX301's benchmark scores in Far Cry 2 were even better, outscoring the rest of the machines by almost double. In fact, the UX301 managed to score almost 40% better frame rates in "very high" settings, and 30% better in 'medium' settings compared to the Acer Aspire S7. While the Zenbook UX301 may have the most powerful CPU and GPU in our shootout, the tradeoff is evident when we look at battery life where it struggled to last just two and a half hours - by far the worst of all of our Ultrabooks. The ASUS' battery life was also further affected by its very bright and high-resolution (2560 x 1440 pixels resolution) display. Surprisingly, despite its high resolution 3200 x 1800 display, the Lenovo Yoga 2 Pro managed to last over four hours. But it's the Toshiba Portege Z30 that boasts the best battery life, lasting for over five hours - although do note that this is probably at least partially due to its 1366 x 768 resolution display. We love the Yoga 2 Pro for its extremely sharp 3200 x 1800 pixel resolution display and versatile convertible form factor Unlike many other convertible Ultrabooks, the Yoga 2 Pro's simple hinge-based convertible design doesn't result in any compromises (like a smaller trackpad or fragile swivel hinge) for its notebook form factor. Performance was also good on the Yoga 2 Pro - even with its super high-res display, battery life didn't suffer and its Intel HD 4400 integrated graphics had no problem driving its display. Best of all, Lenovo have managed to keep the Yoga 2 Pro very affordable without cutting back on build or design quality. It remains slim and lightweight and, while the build materials are mainly plastic, the finishing definitely looks and feels premium.